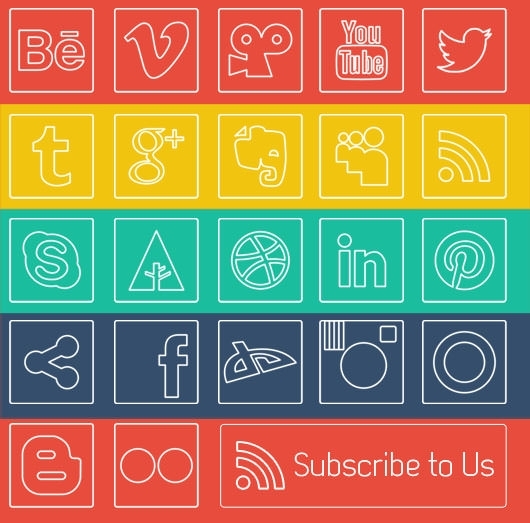 Free PSD social media outline icons allow immense degree of freedom for designers. They can be tweaked with, without restraint on any version of Adobe Photoshop. The hues, opacity, contrast everything can be customized with minimum number of tools, actions utilizing minimum time. Most importantly, these PSD icons are not only free, but they also belong to a huge collection of similar icons which vary from each other in resolution, color and style. So you can keep browsing and free downloading the Flat PSD social media outline icons till you find the perfect match. The Free social media PSD outline icons can be used for linking your website or blog to the most popular social networking sites like Facebook, Instagram, Flickr, Pinterest etc. You can even embed your comment section or discussion forum with these social media icons for easy sharing. The different colors and styles ensure that there is something for everyone in the collection. The Black Social media icons are suave, bold and can go extremely well with photography websites and blogs which have a darker theme, or even a mock wooden theme. On the other hand, the PSD Rounded social media icons are more jovial and better suited for light, pastel themes or even a few vintage themes who want to preserve their originality. You can even download social media icons for email signature in hundreds of shades and styles. The premium versions offer a wider range of customization options. The PSD versions of the social media icons are the best options for all designers by virtue of their unlimited customizability.